Home / Workbenches & Jigs / Box Joint Jig Woodworking Plan. 31-MD-00152 - Box Joint Jig Woodworking Plan. Box joints offer both strength and unique good looks. 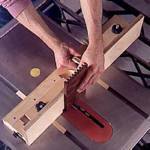 Although not as refined as dovetail joints, they can be cut on a table saw or router table using a simple shop-built jig. Not only that, but you can use a box-joint jig on virtually any width or thickness of stock. Our jig combines simplicity of construction with micro-adjustability. Interchangeable indexing pins allow you to cut box joints of any size without having to build a different jig each time. We used birch plywood, hardboard and birch, but you can use a wood of your choice. A full materials and supplies list is included with the plan. Table saw, drill, router, and common hand tools.